Riley Erickson is a happy young woman. She loves her job teaching fourth graders at Whispering Pines Elementary School, she loves her tightly knit, three-generational family, and she loves her fiancé who in three weeks and two days will become her husband in a lavish Christmas ceremony. But Riley’s perfect world suffers a major blow when her fiancé calls her the day before Thanksgiving to tell her there will be no wedding at Christmas or any other time. He has fallen for someone else, and that someone just happens to be a new teacher at Riley’s school, a woman whom Riley has befriended and made one of her bridesmaids. Jo Wilton, Riley’s sister, tries to comfort Riley, but Jo is having problems of her own. Heavily pregnant, she is finding life without her Navy husband Mike, who is away on duty in a submarine, difficult—particularly so since Mike has decided he should reenlist after they had agreed that eight years was enough. Mr. Perfect is looking like Mr. Not-So-Perfect. If she is going to be bringing up baby as a single mother, she might as well make it official with a divorce decree. Riley’s best friend, Noel Bijou, a writer and illustrator of children’s books, is feeling rather glum herself. Not only is her love life nonexistent, but she has also just received some bad news. Noel loves the little house she rents and had hoped to buy it someday, but her landlady needs to sell it immediately. Noel’s Marvella Monster books are successful, but they are not yet popular enough to bring in the kind of income that will allow Noel to buy the house. To her dismay, her landlady sells the house to a house flipper. Noel is convinced that she will lose her home and be forced to see the new, profit-minded owner destroy all its quirky charm. When Riley, Jo, and Noel agree to cheer themselves up with a post-Thanksgiving visit to Santa at a nearby mall, they encounter an amiable, white-bearded figure who looks far more like the mythical figure than the usual pale imitation available for mall visits. Santa seems to know an astonishing amount of information about them too, and he promises, as a smiling Mrs. Claus looks on, that their Christmas wishes will come true. What follows as his promises are fulfilled in unexpected ways is enough to make the Grinchiest heart believe in the magic of the season. If you are a cynic who mutters “Bah, Humbug!” at the first sound of Christmas carols, this book is definitely not for you. On the other hand, if you fill your house with Christmas lights, place mistletoe in convenient spots, and hang your stocking every year while nurturing remnants of childhood wonder in your heart, you will probably delight in this novel. It is filled with Roberts’s trademark humor along with a generous serving of family, friends, and holiday cheer plus three sweet romances. As for me, I’m a believer. 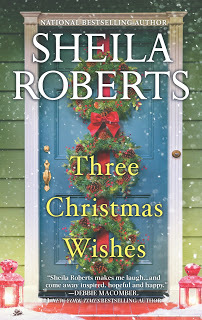 I’m making my wish list, which I plan to forward to Sheila Roberts with the request that she see it gets in the hands of the Santa who gave Riley, Jo, and Noel all they wanted for Christmas. Getting ready to start the Holiday spirit this books sounds right up my alley. Thanks for the review. may get a few flurries tomorrow - perfect time to start reading Christmas stories! This sounds great! I'll be picking this up, for sure. Great review! No bah humbug in my house. Just received word today that one of my brothers will be home for Christmas. I haven't seen him in 4 yrs. I am so excited. I need this book. Another one for my Christmas collection.